La poliangeítis microscópica (PAM) es una vasculitis autoinmune caracterizada por la inflamación de los vasos sanguíneos de pequeño calibre y la presencia de anticuerpos anticitoplasma de neutrófilos (ANCA). Clínicamente se caracteriza por presentar glomerulonefritis y capilaritis pulmonar aunque la afectación de la piel, los nervios y el tracto gastrointestinal no es infrecuente. Presentamos el caso de un paciente de 17 años con manifestaciones atípicas dadas por glomerulonefritis pauci-inmune, hemorragia pulmonar, vasculitis leucocitoclásica cutánea y hemorragia cerebral. Además revisamos las características histológicas y radiológicas. 1. Jennette JC, Falk RJ, Bacon PA, Basu N, Cid MC, Ferrario F, et al. 2012 revised International Chapel Hill Consensus Conference Nomenclature of Vasculitides. Arthritis Rheum. 2013;65(1):1–11. 2. Falk RJ, Gross WL, Guillevin L, Hoffman GS, Jayne DRW, Jennette JC, et al. Granulomatosis with polyangiitis (Wegener’s): an alternative name for Wegener's granulomatosis. Arthritis Rheum. 2011;63(4):863–4. 3. Savage CO, Winearls CG, Evans DJ, Rees AJ, Lockwood CM. Microscopic polyarteritis: presentation, pathology and prognosis. Q J Med. 1985;56(220):467–83. 4. Katsuyama T, Sada K-E, Makino H. Current Concept and Epidemiology of Systemic Vasculitides. Allergol Int. 2014 Oct 25;[Epub ahead of print]. 5. Kallenberg CGM. The diagnosis and classification of microscopic polyangiitis. J Autoimmun. 2014;48-49:90–3. 6. Watts RA, Mooney J, Skinner J, Scott DGI, Macgregor AJ. The contrasting epidemiology of granulomatosis with polyangiitis (Wegener’s) and microscopic polyangiitis. Rheumatology (Oxford). 2012 May;51(5):926–31. 7. Álvarez F, Herrera FR, Contreras ÁS, D GMV, Cañas CA, Chalem M, et al. Vasculitis primarias : 62 años de historia en Colombia. Rev Colomb Reumatol. 2006;13(4):288–305. 8. Cantillo JDJ, Andrade RE. A propósito de dos nuevos casos en Colombia. Acta Med Colomb. 2008;33(2):84–9. 9. Camargo JP, Cantillo JDJ. Poliangeítis microscópica Trece años de su reconocimiento y 91 años a la sombra de la poliarteritis nodosa. Acta Med Colomb. 2008;33(2):90–100. 10. Argote AC, Merlano I. Poliangeítis microscópica Resumen Introducción Caso clínico. Rev Asoc Colomb Dermatol. 2013;21(2):175–9. 11. Jaramillo Garcia LF, Morales Naranjo SD. Poliangeitis microscópica, reporte de un caso. Rev colomb neumol. 2006;18(2):84–7. 12. Grajales CM, Cortés ÁA, Fernando L, Restrepo A, Escobar MR, Alonso L, et al. 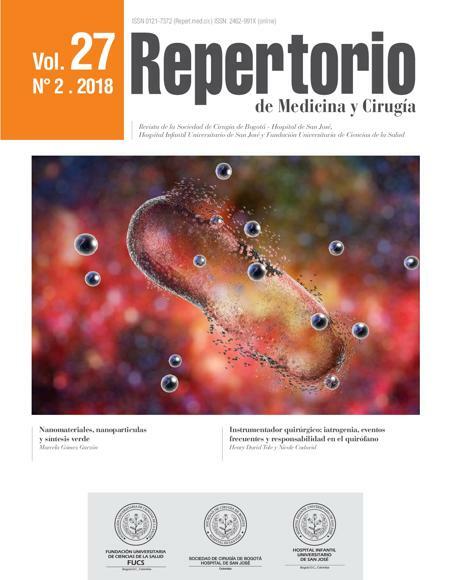 Poliangiítis microscópica : reporte de un caso con enfermedad renal , pulmonar y neurológica , y revisión de la literatura. Rev Colomb Reumatol. 2011;18:121–34. 13. Niles JL, Böttinger EP, Saurina GR, Kelly KJ, Pan G, Collins AB, et al. The syndrome of lung hemorrhage and nephritis is usually an ANCA-associated condition. Arch Intern Med. 1996;156(4):440–5. 14. Niiyama S, Amoh Y, Tomita M, Katsuoka K. Dermatological manifestations associated with microscopic polyangiitis. Rheumatol Int. 2008;28(6):593–5. 15. Hara A, Ohta S, Takata M, Saito K, Torisaki M, Ishida Y, et al. Microscopic polyangiitis with ocular manifestations as the initial presenting sign. Am J Med Sci. 2007;334(4):308–10. 16. Adams HP. Cerebral vasculitis. Handb Clin Neurol. 2014 Jan;119:475–94. 17. Vrancken AFJE, Said G. Vasculitic neuropathy. Handb Clin Neurol. 2013;115:463–83. 18. Latus J, Koetter I, Fritz P, Kimmel M, Biegger D, Ott G, et al. Gastrointestinal involvement in granulomatosis with polyangiitis and microscopic polyangiitis: histological features and outcome. Int J Rheum Dis. 2014;17(4):412–9. 19. Jennette JC, Falk RJ. Pathogenesis of antineutrophil cytoplasmic autoantibody-mediated disease. Nat Rev Rheumatol. Nature Publishing Group; 2014;10(8):463–73. 20. Chen M, Kallenberg CGM. ANCA-associated vasculitides--advances in pathogenesis and treatment. Nat Rev Rheumatol. 2010;6(11):653–64. 21. Kallenberg CGM, Heeringa P. Complement is crucial in the pathogenesis of ANCA-associated vasculitis. Kidney Int. Nature Publishing Group; 2013;83(1):16–8. 22. Kessenbrock K, Krumbholz M, Schönermarck U, Back W, Gross WL, Werb Z, et al. Netting neutrophils in autoimmune small-vessel vasculitis. Nat Med. 2009;15(6):623–5. 23. Matheus Merina LM, Parra-medina R, Ararat Sarria M, Díaz Galvis JA. Cell Death. Autoimmunity From Bench to Bedside. 2013. p. 219–34. 24. Terrier B, Saadoun D, Sène D, Ghillani P, Amoura Z, Deray G, et al. Antimyeloperoxidase antibodies are a useful marker of disease activity in antineutrophil cytoplasmic antibody-associated vasculitides. Ann Rheum Dis. 2009;68(10):1564–71. 25. Sinico RA, Di Toma L, Radice A. Renal involvement in anti-neutrophil cytoplasmic autoantibody associated vasculitis. Autoimmun Rev. 2013;12(4):477–82. 26. Jennette JC, Falk RJ, Heumatology EXR. The role of pathology in the diagnosis of systemic vasculitis. Clin Exp Rheumatol. 2007;25(1 Suppl 44):52–6. 27. Wilke L, Prince-Fiocco M, Fiocco GP. Microscopic polyangiitis: a large single-center series. J Clin Rheumatol. 2014;20(4):179–82. 28. Huang H, Wang YX, Jiang CG, Liu J, Li J, Xu K, et al. A retrospective study of microscopic polyangiitis patients presenting with pulmonary fibrosis in China. BMC Pulm Med. 2014;14:8. 29. Chung SA, Seo P. Microscopic polyangiitis. Rheum Dis Clin North Am. 2010;36(3):545–58. 30. Gómez-Puerta JA, Espinosa G, Morlà R, Cid MC, Cervera R. Interstitial lung disease as a presenting manifestation of microscopic polyangiitis successfully treated with mycophenolate mofetil. Clin Exp Rheumatol. 2009;27(1):166–7. 31. Collins CE, Quismorio FP. Pulmonary involvement in microscopic polyangiitis. Curr Opin Pulm Med. 2005;11(5):447–51. 32. Han S, Rehman HU, Jayaratne PS, Carty JE. Microscopic polyangiitis complicated by cerebral haemorrhage. Rheumatol Int. 2006;26(11):1057–60. 33. Tan J, Hussain A, Daiwajna R, Chai LK, Lim E, Han A. Microscopic polyangiitis complicated by intracerebral hemorrhage and pulmonary hemorrhage in a pediatric patient. Am J Case Rep. 2013;14:276–9. 34. Sasaki A, Hirato J, Nakazato Y, Tanaka T, Takeuchi H. [An autopsy case of P-ANCA-positive microscopic polyangiitis with multiple cerebral hemorrhagic infarction]. No To Shinkei. 1998;50(1):56–60. 35. Matsuda H, Harada T, Ando Y, Nakamori A, Nakatsuka S, Takama T, et al. [Case of microscopic polyangiitis accompanied by central nervous system symptoms and brain vasculitis observed histopathologically]. Nihon Jinzo Gakkai Shi. 2011;53(4):648–53. 36. Kimura H, Akutsu N, Shiomi R, Kohmura E. Subarachnoid hemorrhage caused by ruptured intracranial fusiform aneurysm associated with microscopic polyangiitis. Neurol Med Chir (Tokyo). 2012;52(7):495–8.